What Separates Our Dental Crowns? Dental crowns, also known as “caps,” are placed over teeth that have been compromised through trauma, infection, or decay. Dental crowns are also used to support dental bridges or restore dental implants for patients who are missing one or more teeth and create cosmetic makeovers. The dental crowns at Prosthetic Dentistry of Washington D.C. are crafted on-site, enabling Dr. Marlin optimal control over their creation. This helps us produce dental crowns that are precisely matched in size, shape, and shade to all adjacent teeth as our in-house lab technician works directly with you. This allows your dental crowns to fit comfortably and blend seamlessly into your smile. 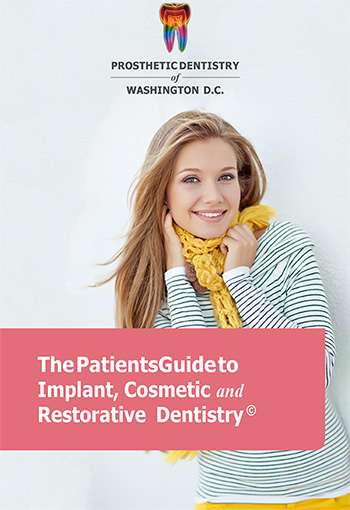 If you are in need of a dental crown or if you are simply overdue for a dental appointment, call Prosthetic Dentistry of Washington D.C. at 202-244-2101 to schedule a consultation with Dr. Marlin. We welcome patients from the Washington metropolitan area including Arlington, Alexandria, Bethesda, and Potomac. Placement of dental crowns takes two office visits. During your first visit, the underlying tooth will be shaped and prepared, making it the ideal base for your crown. Once your tooth or teeth have been prepared, we will make an impression of your smile to use for the fabrication of your crown. If you are having a crown placed over a dental implant, there will be no underlying tooth to shape, but an impression will still need to be made to fabricate an abutment (a custom replica of a prepared tooth) and the overlying crown. Once the impression of your smile has been created, Dr. Marlin will fit you with a temporary crown, which will be worn while your customized restoration is created. Your temporary crown will be made of a strong acrylic and matched in shade and shape to adjacent teeth, and will look and feel as natural as the final porcelain crown. In many instances, you will experience an immediate smile makeover on the day you receive your temporaries. The impression of your smile is used for the creation of your permanent dental crowns. Once these have been created in our in-house lab, you will return to our office to have them customized by our technician to match to your other teeth prior to being placed. Designed with optimal aesthetics and function in mind, the dental crowns placed by our Washington D.C. prosthodontist are carefully crafted and meticulously placed to help ensure their long-term usefulness. The life expectancy of the typical dental crown is five to ten years. If the crown is milled in a CEREC or other CAD/CAM machine, the life expectancy can be slightly shorter. However, the dental crowns produced in our on-site lab have been shown to, with proper care, last for 35 years or more. Our dental crowns are designed to last and crafted to retain their strength and appearance long after other crowns may fail. In part, this is due to our ability to custom fabricate these restorations on-site, where Dr. Marlin has a direct hand in their creation. Our crowns tend to fit better, look more natural, and last longer than those created by third-party technicians who have never seen your actual smile. While our process helps create dental crowns that are surprisingly durable, you will play a role in their longevity. 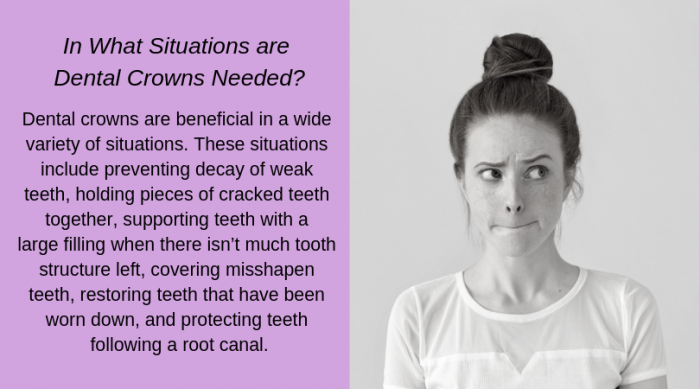 Fortunately, not much special care is needed to keep crowns attractive and strong. During your biannual visits for professional tooth cleanings, we can help you optimize your oral hygiene routine by making personal recommendations for toothbrush and toothpaste types, and provide daily care instructions based on your exact needs and ultimate oral health and beauty goals. At Prosthetic Dentistry of Washington D.C., we have maintained our own dental lab for over three decades. Here, our highly trained lab technicians work directly with Dr. Marlin to produce the strongest and most pleasing dental crowns available. We use an exclusive 3D-shading technique that allows our technicians to perfectly replicate the translucencies and internal/external color variances on your natural teeth. The end result is a crown that is entirely indistinguishable from those teeth surrounding it. This is simply not a possibility when your crowns are processed by someone who has never seen your actual smile and is, therefore, limited in mimicking the internal color of your natural teeth. Our dental crown shading process is unique to our Washington D.C. dental practice and helps ensure that crowns created in our lab offer results that are durable, attractive, and long-lasting. Lastly having an on-site lab allows us to save you time. Crowns from practices that work with external labs have to be shipped. It can take several weeks for crowns to be created and returned under this process. Worse still, when these crowns don’t fit correctly or don’t meet patient needs, they have to be sent back and refabricated. Crafting crowns on-site gives us optimal control over their strength, appearance, and speed of creation. This helps us place crowns that are perfectly sized, ideally shaped, and intricately shaded, better enabling us to produce smiles that look naturally beautiful and feel functionally strong. We work with several insurance companies and will submit all charges to your insurance carrier for your reimbursement, because we are an out of network provider. We ask that you bring your insurance information with you to your appointment to give our patient coordinators all the information needed to submit your bill. It is important to remember that insurance companies have very different goals than their clients. They are driven solely by the “bottom line” for profits, while the clients are seeking the highest quality, longest-lasting crowns. With artificially established low fees, they are not willing to pay the full price of a high-quality dental crown or any other restoration. Please check with your plan administrator to learn how much your policy will cover. In addition to working with various insurance companies, we are happy to discuss financing options including in-house payment plans and healthcare credit cards such as the Lending Club. We also accept cash, checks, and most major credit cards. There is often a discount for cash and check payments when they are made in full at the time service is rendered. All of these things will be discussed in greater detail during your dental crown consultation at our Washington D.C. office. Dr. Gerald Marlin is a leading specialist in implant, cosmetic, and restorative dentistry. One of the only prosthodontists with an on-site milling lab, Dr. Marlin has been voted “Top Dentist” by his peers for more than 20 years in a row in Washingtonian Magazine’s annual “Best Dentist” survey, and is considered the most experienced prosthodontist in the D.C. area. Dr. Marlin holds six United States patents and several foreign patents covering implant restoration and is a frequently sought speaker and lecturer, but his commitment to advancing the industry has not taken time away from his patient care, which is the lifeblood of the practice. Committed, caring, attentive, and effective, Dr. Marlin is dedicated to helping each of our patients achieve optimal comfort and beauty, and to help maintain strong and healthy smiles for life. If you are ready to schedule your appointment with our trusted, experienced, and caring prosthodontist, please call 202-244-2101 today. We welcome patients from Chevy Chase, Bethesda, Silver Spring, Alexandria, Fairfax, Reston, and all surrounding communities.